Friday, 15 February: In the morning, the Ministerial consultations and associated contact groups succeeded in concluding negotiations on all outstanding issues on IEG. Among the agreements: voluntary use of an indicative scale of assessment, and universal participation. The Committee of the Whole (COW) approved for transmission to the Governing Council (GC) all of its decisions, which the GC/GMEF adopted in the afternoon during its final Plenary. After closing statements by Cherif Rahmani, Algerian Minister of the Environment; David Anderson, Chair of GC/GMEF and Minister of the Environment, Canada; and Klaus Töpfer, UNEP Executive Director; GMEF-3 was gaveled to a close at 6 pm. Anderson opened day 3 by urging focus, and described his Chairman's Summary. Regarding UNEP's input to the WSSD, he put several key questions to the Ministers. < View of the informal Ministerial-level consultations on IEG, chaired by Michael Meacher, Minister of State (Environment) of the UK. 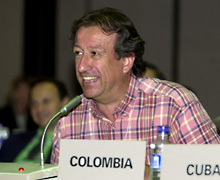 Juan Mayr, Minister of the Environment of Colombia, reported on the positive outcomes of the IEG discussions. He noted that Ministers would not have to negotiate through the night, as is often the tradition. Finland explained her perspective on GC/GMEF priorities, highlighting three categories: overarching issues where UNEP should make a contribution; environmental issues where the GC/GMEF would be the authoritative body; and means of cooperating. She suggested a division of labor between the CSD and UNEP to avoid duplicating debates, with discussions on sectoral issues taking place in the CSD. 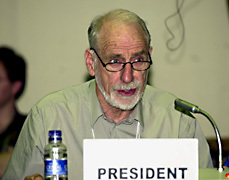 Chair Anderson opened the final Plenary by presenting the Draft Report of the GC/GMEF, and the draft decisions. COW Rapporteur Franklin McDonald (Jamaica) then presented the report of the COW (UNEP/GCSS.VII/L.3) and decisions submitted by the COW (UNEP/GCSS.VII/L.3/Add.1). 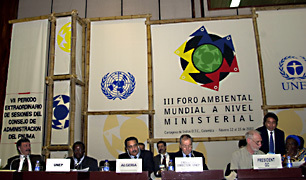 The Governing Council/GMEF adopted a decision on chemicals (UNEP/GCSS.VII/L.3/Add.1), which decides that there is a need to further develop a strategic approach to international chemicals management and enforces the IFCS Bahia Declaration and Priorities for Action Beyond 2002 as the foundation of this approach. 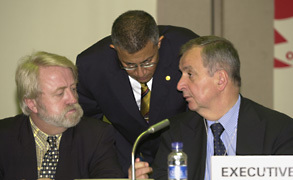 Above photo: John Buccini, Chair of the POPs Intergovernmental Negotiating Committee (left); and Jim Willis, Director of UNEP Chemicals (right). 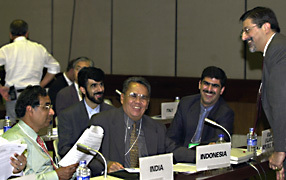 Seated from left to right: Shafqat Kakakhel, Deputy Director of UNEP; Miyingo; Cherif Rahmani, Environment Minister of Algeria; Töpfer; and Anderson. In his closing speech, Cherif Rahmani, Algerian Environment Minister, said the IEG agreement would be a starting point for building a new institutional architecture and called for a "new global deal" in harmony with environmental protection. Anderson closed the meeting by saying that is was a critical step on the road to Johannesburg, and that there was a strong feeling that the summit must be about implementation, concrete action and responsible prosperity. He stated that improved environmental governance is essential for efficient and effective implementation of sustainable development. The view from the back of the hall just as the final Plenary convened. At the request of Colombia's Minister Mayr, delegates agreed to express solidarity with Colombia for the sustainable development for all Colombian people. The original submission called for expression of condemnation of all forms of terrorism, with specific reference to "attacks against the infrastructures or installations such as energy centrals, pipelines and aqueducts", which had "been taking place in Colombia". 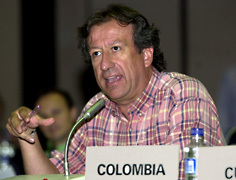 These ideas mirrored the statement made by Colombian President Pastrana to the GMEF at its opening session on Wednesday. 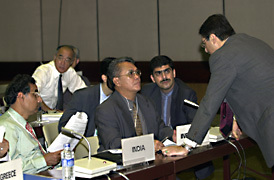 Although sympathetic, some delegations could not agree to the language, which was only introduced at the closing moments of the final Plenary. Palestine withdrew its submission to have its name added as another specific victim of terrorism. In its closing statement, Libya, on behalf of the African Group, said "without sustainable development, humanity would be meaningless." Spain, on behalf of the EU, expressed satisfaction with the outcomes, and said the Cartagena meeting was a positive event which had strengthened international environmental governance. Speaking for the G-77/China of the Nairobi Committee of Permanent Representatives, Colombia said the meeting was a turning point for WSSD preparations. 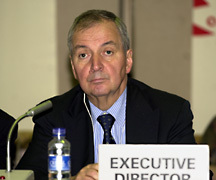 Klaus Töpfer, UNEP Executive Director, noted the high degree of participation at the meeting, underlined poverty as a pressing problem for the whole world and called for investment to developing countries to create social solidarity. 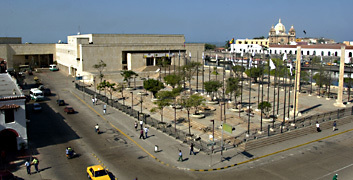 Above: The Centro de Convenciones y Exposiciones de Cartagena de Indias, with its impressive plaza entrance. 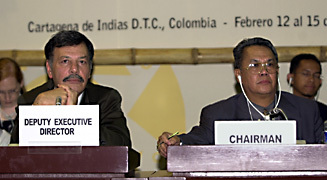 Above: Kakakhel and Tupuk Sutrisno (Indonesia), Chair of the COW. 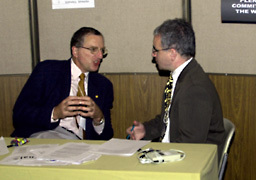 < ... while Mayr confers with Chair Anderson. 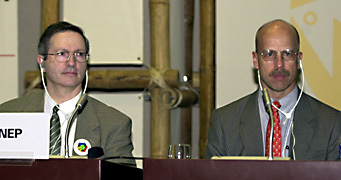 ENB writer Peter Doran (right) interviewing Philippe Roch, Secretary of State, Switzerland. 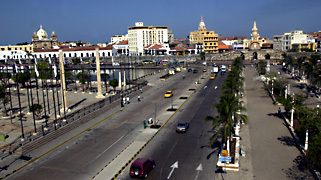 Above: to the right of the Centro de Convenciones' plaza, a view of the fortified old city of Cartagena. Above, and below: Adnan Amin, Director of UNEP's New York Office, having a few words - and a laugh - with delegates from India, Indonesia and Iran. 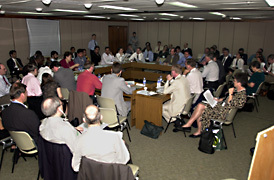 the New York IEG Meeting held on 25 January, and latest version of Chair's "Building Blocks"). 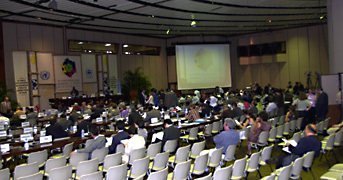 > UNEP's GMEF-2 page with documents for the meeting (including provisional agenda). 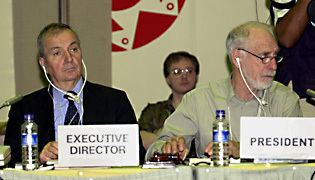 > ENB's coverage of the New York IEG Meeting (25 January 2002). 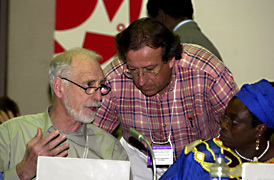 > ENB's coverage of the IGM/IEG-4 (Montreal; 30 Nov - 1 Dec 2001). 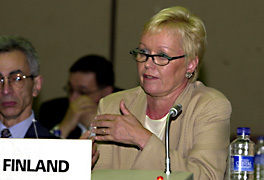 > Linkages UNEP Governing Council page.